Sphinx faro Cramer, 1780, Uitlandsche Kapellen (Papillons exot.) 3: 165, pl. 285, fig. C. Type locality: [India,] "Coromandel" [Tamil Nadu/Andhra Pradesh]. Synonym. Sphinx faro Cramer, 1780. Wingspan: 74--78mm. 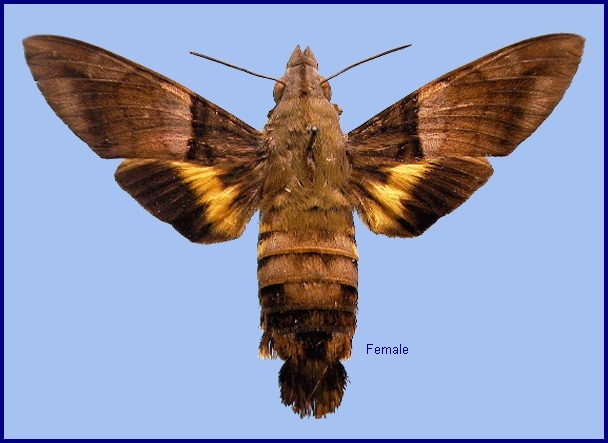 The largest known Macroglossum. 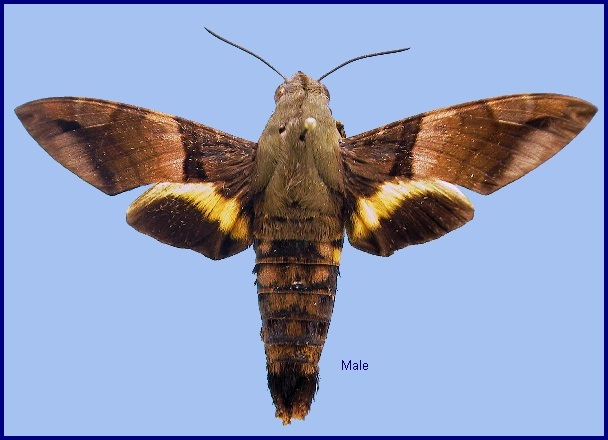 Similar in colour and pattern to Macroglossum passalus, with the following differences: thorax upperside and sometimes the first abdominal tergites green, with no sharply defined dark area on the mesothoracic tegula; abdomen with yellow patches comparatively smaller; underside generally deeper brown; abdomen underside with sternites, at least the proximal ones, with large pale mesial patches; forewing upperside with antemedian lines being more distinctly separate; second discal line much thinner, and the space between first and second not black anteriorly; the black submarginal area being more like a band than a cloud; hindwing underside base obviously shaded with yellow. Male genitalia similar to Macroglossum passalus, but harpe longer, with the tip more strongly recurved and more obviously denticulate; aedeagus with process longer, more acute, with a similar patch of teeth near its base, but these smaller, and the underside of the process densely denticulate. China: viii (Guangdong). Japan: viii (Ryukyu Archipelago). Japan: Ryukyu Archipelago (Okinawa; Iriomoteshima). Southern India, Thailand, southeastern China, southern Japan (Ryukyu Archipelago), Vietnam, Malaysia (Peninsular, Sarawak), Indonesia (Sumatra, Java, Kalimantan).